An essential part of novel writing is world building. Whether events take place in the real world or not, it is important for the reader to feel the characters live and breathe in an authentic, believable place. 'Echo Hall' is set on the borders of England and Wales. Having spent a lot of time in border counties, and in Wales itself, I could have chosen a real place to locate it. However I decided early on to create fictional hills, woods, towns and villages, both to avoid inaccuracy and to let my imagination roam free. This also allowed me the opportunity to create name places that have significance to the story, a trick used by 19th Century novelists which I've always appreciated. My fictional Flint family run a slate quarry, and I wanted a sense of stone, hardness and dust to inhabit every aspect of their lives. Thus, the house is based at the edge of the village of Whetstone (a tool for cutting stone), the nearest town is Sandstown (close to sandstone), and the quarry is based at Bryngraean (Welsh for Gravel Hill). When I began the novel, I had intended Whetstone to be located in Herefordshire, with Bryngraean located somewhere in the Black Mountains. So in 2007, on a rare weekend away with my husband, celebrating our 10th wedding anniversary, I drove around the Happy Valley for inspiration. Somewhere near Bredwardine (where I'd once stayed on holiday), I discovered a neolithic stone chamber known as Arthur's Stone. It is situated at the top of a hill and overlooks woods that are edged by pine trees. In my imagination Echo Hall was just the other side of those trees, allowing Arthur's Stone to become a regular meeting place for all my characters. The real Arthur's Stone is actually very small, but the power of writing fiction means I could reimagine it as tall enough to enter, allowing people to take shelter there, and carve their names on the stone at the back. During the same trip I also drove to Hereford to help me think about Sandstown. The drive from Happy Valley, helped me create the road from Whetstone, whilst the large Edwardian properties on the edge of town with hills in the background, shaped my idea of Rachel Walters' family home. However, everything else is mine, and in reality Sandstown is an amalgamation of a number of beautiful Cathedral cities - Shrewsbury, Hereford, Winchester, Canterbury and York. After that trip, I discovered that there had not been as much slate mining in South Wales as I'd thought, and what I'd believed was a working quarry, was in fact simply a business selling slate. My imaginary landscape was shifting too. 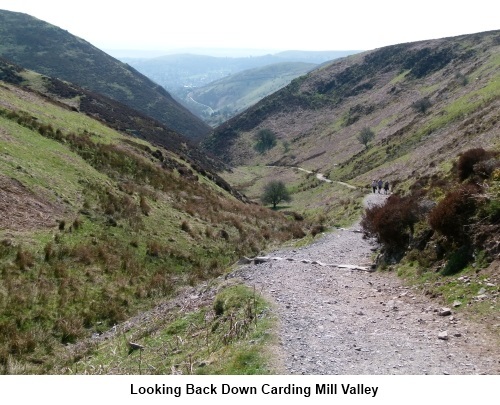 The hills became craggier and less rolling than the countryside round Hereford, inspired by walks with my mother on the Long Mynd in Church Stretton. 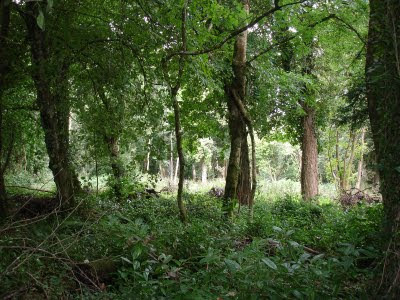 Rectory Wood in Church Stretton and woods on Caldey Island, and Stackpole in Pembrokeshire also inspired the descriptions of the woods behind Echo Hall. I became obsessed with the look of Whetstone driving around the Welsh border on holiday in Radnorshire. These mental pictures were added to by on-line photographs which made me realise that the landscape was more akin to North Wales and South Wales. Though the village post office was directly influenced by the local post office I once visited when staying with my friend Ann in Pont-Rhyd-y Groes near Aberystwyth. And the more I read about slate mining, the more I realised that I needed to move Whetstone north. So by 2013, when I visited Gladstone's Library in Flintshire, I decided to relocate there. A few weeks after my trip to Gladstone's Library. I drove to Llangollen in search of a real life quarry that I had found on the internet. I missed the entrance, which was on a sharp bend in the road,so I parked the car in a layby and trudged back through thick snow to the road up to the quarry. I wasn't expecting snow and had light shoes on, which nicely fitted with descriptions of Elsie walking in the snow to visit Daniel. I had originally hoped to visit the quarry itself, but hadn't been able to contact the owners. So I only walked a little way past the entrance, enough to get a sense of the potholes, diggers, rising mist that Ruth sees on her first visit. Luckily the Llangollen Museum provided plenty of information on slate mining, whilst a book on quarries, internet searches of ruined villages and the memory of abandoned cottages in the Stiperstones, was enough to do the rest. My fictional Bryngraean arose from a mish-mash of these images, whilst a long ago trip to Llechwedd Slate Caverns and a look at their website, created the scenes where Ruth and Rachel enter the quarry. Another place that is important to Ruth, is Emma Goldman Farm, where her friend Nisha lives in a pacifist community. This too is fictional, though there are roots in real life. The muddy road up to the house was drawn from a house I visited with my friend Ann, which was set on the edge of a farm. Whilst the actual property and community bears a passing resemblance to the Catholic Worker Farm which is based on the edge of London and where I spent some time writing Echo Hall. (However, my fictional pacifist community is not a Christian one and does not host refugees. They do however, both have an organic garden). Last, but not least, there is Echo Hall itself. My mental picture of the house arose very soon after I began thinking about the novel. A large slate grey house, with tall windows, I see it as an ominous, brooding presence throughout the story. There is nowhere, quite like it in real life (though I've found a few images that come close). However, the entrance to the driveway is inspired by a holiday house I stayed in near Machynlleth in the 1990's. On a more recent holiday in Pembrokeshire a few years back, I found Scolton Manor. Although it all wrong on the outside, the interior really helped flesh out the inside of Echo Hall. It was particularly helpful in seeing the lay out of Edwardian kitchens, the green baize door which separates the lives of the occupants from those of their servants and the internal system of bells which enable inhabitants to call servants at will. Blending real and fictional spaces, I've worked hard on the descriptions of Echo Hall and its environments which I hope brings a sense of the place in which my characters inhabit. It is my hope that when you read it, I've done a good enough job, and you are left with a feeling that somewhere in the real world, such fictional places exist. Join 164 other awesome people who subscribe to new posts on this blog.